According to Vastu, the cosmos is full of beneficial energies which we must learn to tackle as well as keep in balance if we wish to experience a state of well-being. Energy is essentially emanated by two forces- the five elements and the electro-magnetic energy generated by the rotation of earth. Earth is a third planet among the nine planets and the only place where life exist due to the presence of panchbhootas. Sun, air and space are universally available and can be moulded in accordance with human needs by the act of design. Life exist due to the presence of panchbhootas. Sun, air and space are universally available and can be moulded in accordance with human needs by the act of design. 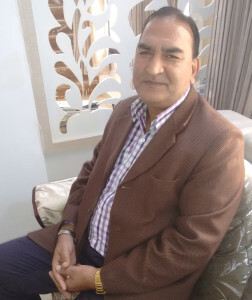 Shree Dinesh Kothari is Builder & Developer, Architect, Fengsui, Vastu, Astrology & Numerology Consultant. He has a clientele from all walks of life and from almost every corner of the country, whether from Delhi, Bombay, Surat, Pune, Aurangabad, Siliguri, Kathmandu, Ahmadabad, Chennai, Jaipur, Udaipur, Bhilwara, Guwahati, Chandigarh & outside India also. Our focus is to provide solution by easy Remedy and Balanced Name across the world with knowledge oriented best Astrological, Numerological and Vaastu Services to quickly solve Human Problems. Dishao is a scientific combination of Astrology, Numerology and VastuShastra. We are providing affordable Astrological ,Numerological and Vaastu Related Product and Services around the world. We thoroughly study each customer’s Horoscope both Astrologically and Numerologically. Depending on Customer's Problem we check land Energy (Positive or Negative), Vastu Kundali (Flying Charts), Personal Vaastu, Yearly Vaastu and provide solution by Yantra and predict accurate Remedies. Accurate Numerological characteristic report & predictions for specific questions regarding your health, wealth, relationship, business, finance, job, education various ailments, foreign travel etc. Perfect and accurate prediction will always guide you to brighten your future through scientific and simple remedies. All the astrology solution like precious stone, energy oil and para card. Correction of personal name, firm or companies name as per numerology. Perfect Numerology tells us tendency, personality and probability, so that we can be aware of coming dangers , diseases, situations and challenges. Diagnose of Geopathic Stress ( Land Energy ), Personal Vastu, Yearly Vastu and provide Vaastu solutions by scientific instruments (Yantra) for Industrial, Residential, Commercial Establishments. "बिना तोड़ - फोड़ - यंत्रो के माध्यम से वास्तु सुधार"